This April Fool's Day CBS All Access will finally bring us all out of our reality and into a new version of the classic 1959 anthology series created by Rod Serling, The Twilight Zone. This updated reboot of the famous sci-fi series is coming our way via Get Out writer-director Jordan Peele and today we have word that the impressive cast is growing more and more by the day. 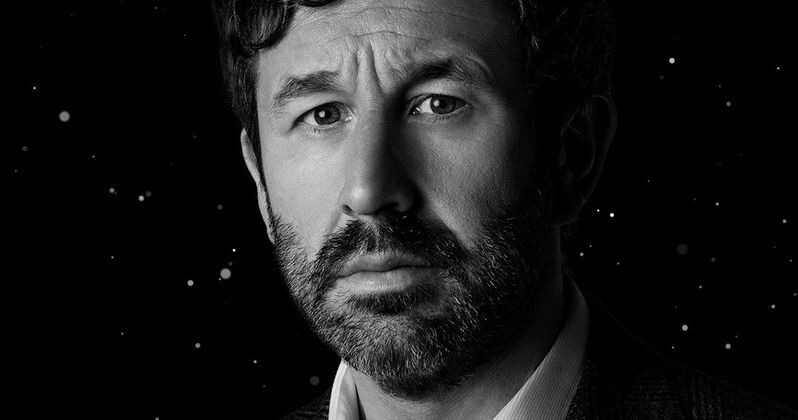 Case in point, today announces that The IT Crowd and Bridesmaids star Chris O'Dowd will be joing in on the fun as well. While the powers that be behind the scenes have not revealed any character details at this time, we do know that Chris O'Dowd is set to star opposite Amy Landecker (Transparent, Doctor Strange) in an episode that is going by the intriguing title "The Blue Scorpion." On top of the above-mentioned roles in The IT Crowd and Bridesmaids (which are my personal favorites of his), O'Dowd has also starred in hit movies such as Judd Apatow's Knocked Up semi-sequel This is 40 with Paul Rudd, and How to Lose Friends & Alienate People with Simon Pegg. He's also starred in Dinner for Schmucks with Rudd and Steve Carell, Gulliver's Travels with Jack Black, and even a role in the MCU with Thor: The Dark World. Other new classics which O'Dowd lends his talents to include Christopher Guest's Mascots, Tim Burton's Miss Peregrine's Home for Peculiar Children, Richard Curtis' Pirate Radio, and Netflix's The Cloverfield Paradox. On top of that, the actor also has a killer career going as a voice actor on Family Guy, Monsters vs. Aliens, and Mary Poppins Returns. And let's not forget his turns as Thomas-John on Lena Dunham's HBO series Girls and Miles Daly on Get Shorty. O'Dowd joins a killer cast of The Twilight Zone which already includes the likes of Seth Rogen, Taissa Farmiga, John Cho, Zazie Beetz, Adam Scott, Betty Gabriel, Kumail Nanjiani, Ginnifer Goodwin, Jacob Tremblay, Erica Tremblay, Tracy Morgan, Sanaa Lathan, Steven Yeun, and Allison Tolman. But that's not all, the series has also snagged stars such as Greg Kinnear, DeWanda Wise, Glenn Fleshler, Jessica Williams, John Larroquette, Lucinda Dryzek, Chris Diamantopoulos, Rhea Seehorn, Jefferson White, Zabryna Guevara, Jonathan Whitesell, Luke Kirby, Ike Barinholtz, Percy Hynes White, and James Frain. Lathan is expected to appear in an episode entitled "Rewind" with Fleshler, while Scott and Diamantopoulos will appear in an episode entitled "Nightmare at 30,000 Feet", a remake of the original series episode "Nightmare at 20,000 Feet". Rogen, Nanjiani, Cho, Tolman, Jacob, and Erica Tremblay, Morgan, and Larroquette are expected to appear in an episode titled "The Wunderkind," and Yeun and Kinnear will appear in an episode titled "The Traveler." Goodwin, Frain, and Guevara will guest star in an episode titled "Point of Origin"; Wise, Williams, Dryzek, White, and Whitesell are expected to appear in one episode with Farmiga, Seehorn, Kirby, Barinholtz, and Hynes White featured in another. Beetz and Gabriel will appear in an episode together as well. On top of acting as the narrator for this new version of The Twilight Zone, Jordan Peele is also an executive producer along with Marco Ramirez, Simon Kinberg, Win Rosenfeld, Audrey Chon, Carol Serling, and Rick Berg. The anthology web television series is set to premiere on April 1, 2019, on CBS All Access. This casting update comes to us via Deadline.